Gregory Wayne "Greg" Abbott (born November 13, 1957) is an American lawyer and politician. 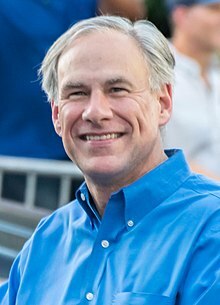 He is currently the Governor of Texas. He defeated Wendy Davis in the November 4, 2014 general election. Prior to being governor, he was the 50th Attorney General of Texas. He is a Republican. ↑ Mildenberg, David and Laurel Brubaker Calkins. Grit Drives Abbott to Follow Perry as Texas Governor, Bloomberg Businessweek, September 19, 2013. ↑ "Unknown to Most, Cecilia Abbott Could Make History". The Texas Tribune. Retrieved November 8, 2014. This page was last changed on 13 November 2017, at 04:37.